Torrington – Rosemary Woolsey, 80, passed away on May 9, 2018 at home in Torrington. She was born in Torrington, Connecticut on May 18, 1937 to the late William and Margaret (Nagle) Woolsey. Rosemary participated in the Special Olympics where she competed in Wheelchair events and going to church. She enjoyed going to the Casino and motorcycles, especially bike week in Torrington. She loved traveling, the color pink and tending to her flowers in her garden. Rose lived her life in CT's North West corner, but made Torrington her home. She retired from The Voice, Community Newspapers where she worked as a clerk. Rose will be remembered as a petite women who dreamed big and lived big by not allowing her disabilities to dictate how she lived. 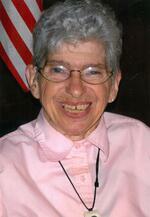 She received support through the Area of Litchfield County (LARC) for the past 40 years. She will be remembered most for being a woman that knew what she wanted and advocacy to achieve whatever she wanted. Trust to Rosemary is something that you earned, once you received her trust you were her family. To send flowers to the family of Rosemary Woolsey, please visit our Heartfelt Sympathies Store.